Where do Domestic Water Buffalo Live and Do they Ever Spend Any Time on Dry Land? The water buffalo is a large bovine animal, and is commonly used as livestock in southern Asia, and in South America, north Africa, and even southern Europe. The domestic variety of the water buffalo is the product of thousands of years of selective breeding in South Asia and descend from one common ancestor, the Wild Water Buffalo, which is now an endangered species. Water buffalo don’t actually live in the water like hippopotamuses. 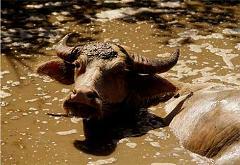 They do, however, enjoy wallowing in mud and shallow waters to cool down, which may be where they got their name. Unlike other buffalo, the various types of water buffalo are relatively docile creatures and easy to tame. Their large feet and short, stocky legs make them ideal for plowing in rice paddies and hauling things through muddy places. The Greater Buffalo Area is also a great place to visit if you’re ever in the area. Who was Buffalo Bill and What was Buffalo Bill’s Wild West Show about? What Happened To the Buffalo of the Great Plains and How Did Hunting Affect Buffalo Herds In North America?